I’m always on the lookout for ways to keep my gadgets charged when I travel. That usually refers to my phone when I’m at conventions, where service is terrible and my trusty iPhone battery dies quickly — but sometimes it’s my kids’ iPods or an iPad or even other phones. It can be a pain when you’re on the move and don’t want to stuff a charger and a bunch of cables and connectors into your bag. Which is where the Powerbag Backpack 3000 comes into play. 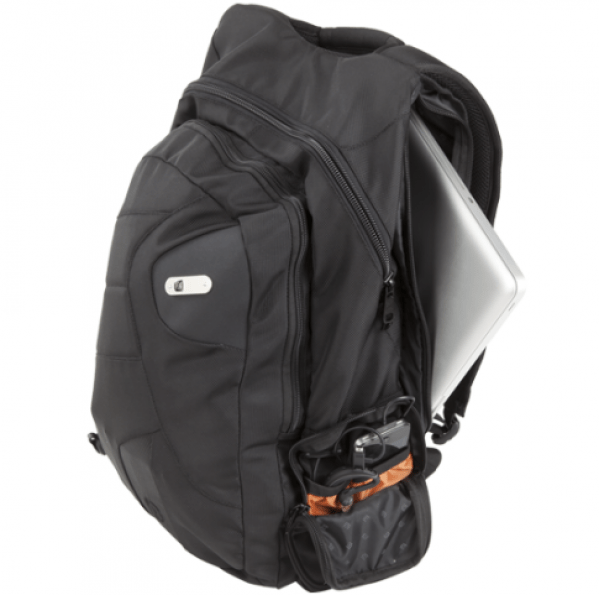 It provides not only a sturdy backpack with plenty of pockets for all your stuff, but also a built in charger and connectors so you can charge no matter where you go. This product combines a Fūl backpack with a 3000mAh battery that plugs into a port on the bottom of the bag’s interior pocket. It gives you enough power to charge most smartphones twice. To recharge the battery itself, you just plug the included AC adapter into the front of the bag, rather than having to dig through a full bag and remove the battery each time. You can even leave all your devices plugged in and charging and they’ll charge up first followed by the Powerbag battery. A one touch button illuminates battery level lights on the front of the bag so you know when you’re running low. Once your battery is charged and ready, you can easily charge smaller devices through a side pocket which contains the PowerVine System. This includes an Apple, micro-USB, and mini-USB connector. Plug in your gadgets, tuck them into the little pockets, zip, and you’re on the move and charging. There’s also a standard USB port right by the battery in the large interior pocket to use for other devices, including tablets. One of the things that makes this backpack shine is that it not only charges gadgets, but it’s also a quality bag by itself. As a genuine Fūl backpack it’s well-constructed, with a padded 16″ laptop compartment, a 15″ side-entry laptop compartment, a padded interior tablet compartment and lots of little pockets for whatever you need to bring along. I could easily pack everything I’d want for a day out with the kids, or a day at a convention, and still have room leftover to fit in a few trinkets. It also has suspension contoured backstraps so even full to the brim it can be easily adjusted for comfort. The Powerbag Backpack retails for $139.99 so it’s a bit more expensive than your average backpack, but when you consider what you’d pay for a portable charger and a good backpack separately, then it’s an incredible price. Powerbag also makes a larger backpack which includes a bigger battery and additional styles including messenger bags and slings. 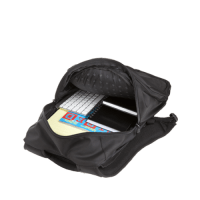 If you need to charge your gadgets while you’re on the move, and you don’t want to worry about fumbling for cables and connectors, then the Powerbag is the way to go. I received this product for review.